The tailor character has various phases. Mostly a broken person in captivity, but there are other phases I’d like to illustrate. So here are some messy gestures I’m ideating. In reality, the Tailor is already done. Has been done for a long time. But I didn’t really have the time to do a series of situational gestures. I realize while visually I have him down, I don’t have mannerisms or general mood to him personally that I want to know going into key illustrations. Cart before horse. Bad. But it has worked so far. - is name a particular character in the story uses, not necessarily one I use myself. I’m under the weather and stuck at home, but still able to get some low-energy work done. Here is a recording of something I’ve been working on. These are the individual patterns of themes found in the story. The Master Tailor - A closeup of his physical makeup and how it functions to transition. I’m in a mood where I want to wax poetic about… something. I can’t though, but I can spit some truths. It’s probably been the hardest thing I’ve done to take a 6 month hiatus. Yeah, I’ve been posting something at least once a week (she says as she misses posting stuff for 3 weeks), but feeling that struggle to squeeze enjoyment out of it was always there. Not uncomfortable enough in any sort of way to even think that I don’t love doing this, but the feeling of walking in wet cement is a mild concern. The worst part is is knowing the radio silence in general. Social media has never been my strong suit, but seclusion against close friends is something I’m ashamed of and not sure how to approach. It is a trait along with several others that I know I’m not the only person of this temperament to struggle with. You have this irrational thought that your burdens become burden to others. And I know, when someone else is doing this to me in turn, that would never be the case, and that concern and understanding would be there whenever they wanted to come out. I don’t claim to know the thoughts of my friends intimately, however. It could very well be a last straw. All I know is, I miss everyone and feel like a stranger to myself and others around me when I lurk to see their goings on and creative output. I tell myself “don’t push yourself until December” before I do another evaluation of my situation. Not that I have unrealistic expectations, but I feel pretty confident about it. The fact that I’m itching to get back into things now is a good sign, but I know if I rush into it, it may give me a false sense of productivity. It takes work to decide to do other things, to leave my desks and apartment to do tasks that I don’t exactly know if I enjoy or not. They come with their own stressors (sometimes not worth it at all on some days) and I see them as stimuli to contrast other parts of my life. I never lack intent in what I set myself to, and it eats at me a bit to know it is used as a balm for a real passion that isn’t all there at the moment. Exercising to be functional outside of creative bubbles is important to me because lack of social ability can atrophy just like anything else and in my current state, is probably the last thing I need. I’m already frustrated at my meekness I’ve adopted due to it all. I’m sure the folks that really know my crassness would spit out their drink at that and probably count others lucky that they don’t know it at all. I decided to do some character development with Angelique. Surprisingly, I need more environmental and prop elements to help flesh her out. I lost this file due to corruption halfway through. Acquired a program to help recover it. I didn’t flesh it out as much as I’d like, but lately, I don’t think I should. I still don’t know enough. I cannot explain how jankily quick the experimentation was on this. Grabbed a character and slapped a concept together with what I’ve made so far. Decided to check out a few bashing tutorials and the one thing I noticed in a vast majority of them was the use of sharpening and bloom. Not something I find appealing for my own illustrative work, but if I need to bang out some concepts, I’d give it a try. I can’t find the photo reference I used to do the initial study. Wish I could credit you, even though it was a royalty free stock image. Isn’t that always the truth? I think it should be for crafts. These are actually a little old in an “I don’t know how to properly organize my geometry groups and make functional structures. I’m better now! But this was kind of before I really came into understanding 3D as something I could use with some proficiency. While trying to juggle ZBrush, I realize I’m oversaturating myself with what I choose to use to produce work with very little output for environments. It reminds me of the artists who get caught up in studies and don’t exactly execute what they learn. I’ve since learned to better use Sketchup. While currently trying to attempt using VRay rendering for it, I don’t exactly plan on using solid renders to create environments for The Master Tailor. 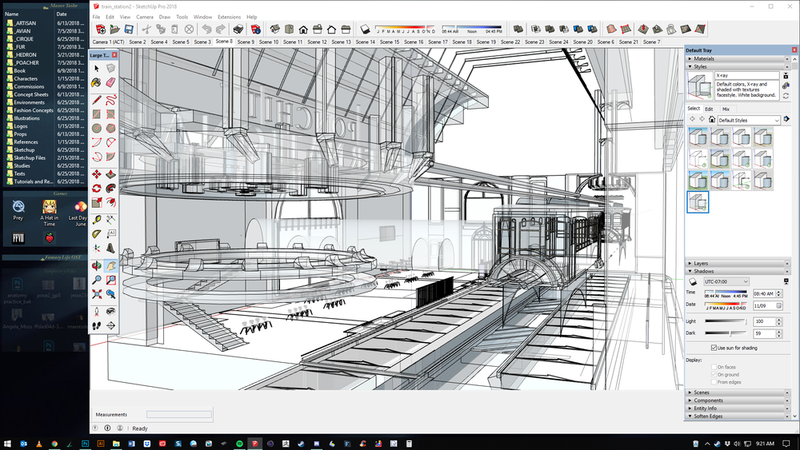 I’ll more that likely use the wireframes for clean drawings, and if I do use the renders, it will be in photobashing techniques for interiors or major scenes. This was a hypothetical location to try and come up with an idea for environments. It is too futuristic for me, and wouldn’t exactly be recognizable in a New Orleans setting. I did learn what I didn’t want to do though, and I will convert the assets for this in other settings. Not much to post this weekend. Too many party. I am glad I am coming into a routine again, though. So, The Master Tailor, the project that consumed most of my art life, needs assets. Yes, assets. Not illustrations, concept art, or models, sketches...whatever. In order to do those, I need some parts to make up the backbone for expediency and continuity. Oh hey it's 5AM and I need to get in 3.5 hours of Tailor work before work work. It gets me through the day, most of the time when I get caught with glazed-over eyes. Assets for dayz. Because of an extensive break from illustration and art responsibilities, I've had a lot of time to recharge for the Master Tailor project. The first laborious task is the creation of the art assets I will need for many illustrations. A lot of time is spent creating brushes, patterns, nozzles - all kinds of things that will speed up my work flow. It can be mind-numbing, but also therapeutic spending so much time on tiny little art pieces in and of themselves to make something much larger. Because the setting is in New Orleans, tons of local planlife will be needed for what I hope will be a large variety of environments. With swamps, forests, fields, and the city itself, the overgrowth will need tons of variability between hand painting. Yucca buds. I suppose I could go the Photoshop route with their brushes, but while I find it great in its rudimentality, it leaves far too much work remaining after the initial laying down of textures and colors for the way I work. PS is useful for the background and tertiary details of my work for sure, but for the focal elements, Photoshop's ability in this case pales in comparison to Painter's nozzle and brush abilities. I think it is one of the reasons why so so many artists shy away from the program. It takes a ton of work and learning up front to get to where the program becomes useful on an individuals's tastes, and I don't blame anyone for not having time for that. Especially in a production environment. More more more. I will not post how many of these I actually did. It's a lot. 2 days worth. Oh no... can you tell which figures I started with at the beginning of the session? It has been years and I'm deeply ashamed. But here we are so let's get back to it. Existing characters are being added to the Tailor landing page. I am trying to decide if I want to add anchors to separate the concepts from the illustrations. I'm planning to add full thumbnail galleries will be added to the end of each section if the contextual information isn't desired for perusal. After about 8 years, I finally decided to change my site name. There are several reasons why, but for the most part, it was simply because people have gotten my name wrong due to it. My last name isn't Hart, and I feel my actual name should be more identifiable as a whole. It will auto-forward from krhart.com for a year, so perhaps that is enough time to allow adjustment to the new name. Instead of using a half-arsed page of incomplete information on this project, I've changed the focus of the site to it. The gallery will remain, but mostly be on the back-burner. The landing page will be entirely focused to the project, with anchors to each individual update. There is also an official ArtStation in the works and will provide expanded information and works in progress for posts I make here. I have a lot queued up to complete and hopefully will find some consistency on these updates.